New York, NY - November 8, 2012 - Kino Classics is proud to announce the Blu-ray and DVD release of The David O. Selznick Collection , a box set of Kino's releases of five films culled from the personal collection of producer David O. Selznick preserved by the George Eastman House Motion Picture Department, newly mastered in HD and authorized by the Selznick estate. 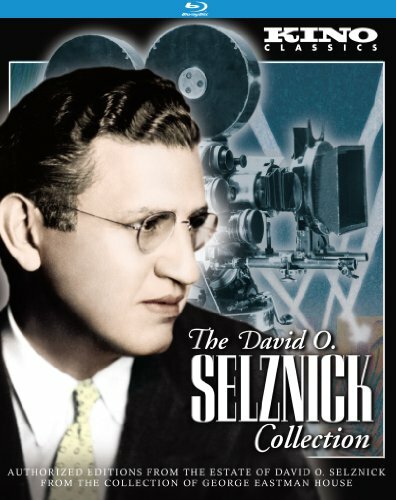 The David O. Selznick Collection comes to Blu-ray and DVD on November 13th, with a SRP of $99.95 for the Blu-ray edition and $79.95 for the DVD edition. This five-disc box set includes the 1932 Paramount version of A Farewell to Arms, directed by acclaimed filmmaker Frank Borzage; the Technicolor productions Nothing Sacred and A Star is Born (both directed by William Wellman); Bird of Paradise, an exotic South Seas adventure starring Dolores Del Rio and Joel McCrea and directed by King Vidor; and the timeless Frances Hodgson Burnett story Little Lord Fauntleroy, starring Freddie Bartholomew and Mickey Rooney. One of Hollywood's most celebrated moguls, David O. Selznick began his career as a producer at RKO and MGM before establishing his independent production company in 1936, where he produced such acclaimed films as Nothing Sacred, A Star is Born, Gone with the Wind, and Duel in the Sun. His legacy lives on in these timeless classics from Hollywood's Golden Age. A ravishing adaptation of Ernest Hemingway's legendary novel, A Farewell to Arms stars Gary Cooper (High Noon) as Lt. Frederic Henry, a young ambulance driver for the Italian army in WWI, more interested in chasing women than the enemy. When seeking cover during an air raid, he encounters Nurse Catherine Barkley (a radiant Helen Hayes), and the world shifts under his feet. They fall in love, but the war keeps wrenching them apart. These painful separations force Frederic to choose between love and battle, a decision that tests him morally and spiritually, and leads to one of the most rapturously romantic endings of all time. Directed by the great Frank Borzage, winner of Best Director Oscars(R) for 7th Heaven (1927) and Bad Girl (1931), A Farewell to Arms was a Best Picture nominee, and one of the crowning achievements of the studio system. This edition is mastered from an original 35mm nitrate print held in David O. Selznick's personal collection, which Selznick acquired when he secured the rights to the story for his 1957 remake. It presents the film in its full 89 minute running time. Mastered in HD from an original nitrate 35mm print, preserved by the George Eastman House Motion Picture Department. He's an unscrupulous newspaperman eager to exploit the story of a young woman's death by radium poisoning. She knows she's not really dying but can't pass up a free trip to New York with all the trimmings. So begins William Wellman's wonderful black comedy Nothing Sacred, starring Fredric March and Carole Lombard. Legendary screenwriter Ben Hecht's sharply satirical screenplay, depicting the morbid nature of the scandal-hungry public, is more relevant than ever - with such wonderfully comic lines as, "Doctor, I want to know the worst...we go to press in fifteen minutes!" Wellman keeps the comic pace frantic in one of the screen's cleverest screwball comedies. With a supporting cast featuring some of Hollywood's funniest character actors, including Margaret Hamilton, Charles Winninger and Walter Connolly, Nothing Sacred is nothing less than hysterical. Mastered in HD from an original Technicolor nitrate 35mm print, preserved by George Eastman House Motion Picture Department. Esther Blodgett (Janet Gaynor) comes to Hollywood with dreams of stardom only to have them shattered by a ruthless, cold-hearted town without pity, where the chances of finding fame are one in a hundred thousand. Enter falling (and falling down drunk) movie star Norman Maine (Fredric March), whom Esther meets at a Hollywood party. Maine gets Esther a screen test and she's an instant success, and the publicity machine sets about recreating the small-town girl. But as Esther (reborn as Vicki Lester) rises to celebrity, Norman's stardom plummets, landing him in an alcoholic depression from which true love and Tinseltown fantasy may not be able to rescue him. From legendary Oscar(R)-winning director King Vidor (The Crowd, Duel in the Sun) comes an exotic tale of romance set in gorgeous Polynesia: Bird of Paradise. Johnny (Joel McCrea) is an intrepid young sailor traveling the South Seas who falls in love with Luana (Dolores del Rio), the beautiful daughter of an island chief. But Luana is betrothed to a neighboring native prince, and is soon to be married. With little thought to the future, Johnny and Luana elope together, searching for paradise in each other's arms. With McCrea at his most dashing and del Rio at her alluring height, Bird of Paradise is a movie of wild eroticism and thrilling adventure, and not to be missed. John Cromwell's 1936 film version of Little Lord Fauntleroy is the definitive rendering of Frances Hodgson Burnett's beloved novel, a heartwarming classic with delightful performances from Freddie Bartholomew and Mickey Rooney. After the death of her husband, the patient Mrs. Errol (Dolores Costello) raises Ceddie (Bartholomew) with much goodwill, but little money. Out of the blue, Ceddie is summoned to England to become heir to the fortune of the Earl of Dorincourt (C. Aubrey Smith), his estranged grandfather, and take the title of Lord Fauntleroy. But there are obstacles: the curmudgeonly Earl refuses to allow Mrs. Errol into his home, and then another young boy claims to be the true inheritor. Only through the intervention of Ceddie's old Brooklyn friends can this mess be put straight.